View Zavio IP Cameras and Network Video Recorders (NVR) Live and Playback Recorded Video with the CamGraba Mobile App for Android. The Zavio video surveillance app for Android that is used to view Zavio IP cameras and control Zavio network video recorders (NVR) from remotely over the Internet. 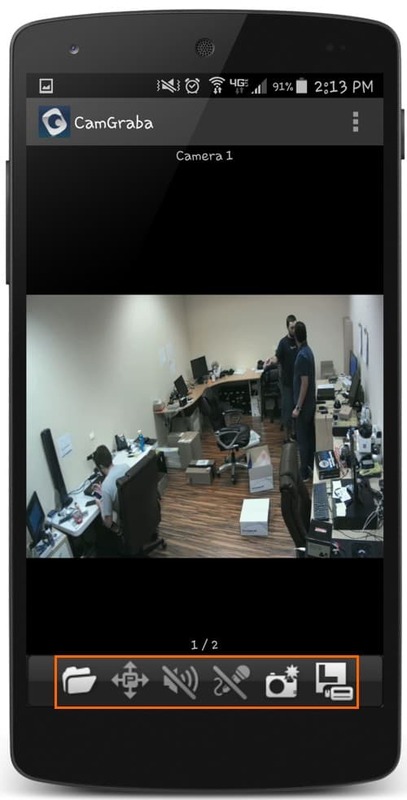 This mobile app allows users to remotely view their security cameras live and also playback recorded video from the hard drive of Zavio NVRs (PC based and stand-alone models). Other features include pan, tilt, zoom camera controls, digital IO controls and two-way audio (if the camera supports it). This article will familiarize customers with the user interface, functions, and controls built into the app. This app is designed to connect to Zavio Network Video Recorders and PC based NVRs that use the 64 channel IP camera software included with all Zavio cameras. Please note that this app cannot connect directly to IP cameras. Users MUST use a network video recorder. 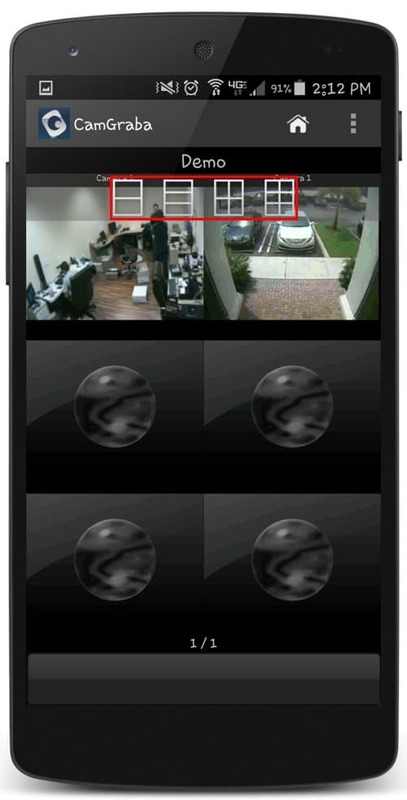 The above screenshot shows the live multi-camera viewing screen of the app. There are two cameras connected. Screen Layout - Users can choose to view 2, 3, 4 and 6 camera grid displays. Users may also view a single camera at a time by double tapping the desired camera. The screen above displays the controls featured on the app for individual cameras. Camera Controls - This section features a variety of camera controls. Recorded Video Search - Opens the recorded search and playback screen so users can view previously recorded video data. Pan / Tilt Controls - This allows the user to manually Pan / Tilt their camera (Only for Pan / Tilt IP cameras). Audio On / Off - The user can choose to hear or mute the camera's audio on their phone while viewing. Microphone On / Off - If the cameras support two-way audio, the user can turn on the mic of their phone and speak into it. The audio will then be heard from the camera's speaker. Snapshot - Takes a snapshot of the screen and gives the user the option to save or email the picture. Video Quality - Allows for selection between high and low-quality video resolution. The app supports both portrait and landscape views. There are three cameras connected to the above app. You can find the latest version of the CamGraba app here. Click here to learn more about the latest Zavio IP cameras.